The term "cockatoo" is a Malaysian word thought to have possibly two meanings, "pincher" or "old father". The term 'pincher' is definitely descriptive as the cockatoos have extremely powerful beaks. Colour - Plumage, either white or dark. Several cockatoo species are readily available in the pet industry. You should be able to find cockatoos for sale from a pet store. You can also find cockatoos for sale from bird breeders, bird farms, and often on-line. There are many hand fed babies becoming increasingly available. The Bare-Eyed Cockatoos may not be the prettiest parrots in the world, but they more than make up for it in personality. Sweet, playful, and intelligent, Bare-Eyed Cockatoos are becoming more and more popular as pets in the homes of bird lovers everywhere. In the wild, all cockatoo species live together in flocks. Some species may flock in groups of only 8-10 birds while others species will flock in the thousands. This high socialization need has a profound affect on cockatoo behavior. If they don't get the necessary attention and interaction they can quickly become bored. A bored cockatoo will often develop bad habits like screaming and feather plucking, and these habits are extremely difficult to break. Keeping Single Cockatoo:Intelligent and highly inquisitive, coupled with a great need for companionship, shapes the cockatoo behavior. Cockatoos are constantly active and always up for playing and interacting with a friend. Keeping a single cockatoo will take serious commitment of time and attention from you for your pet to thrive. Each day you will need to spend a good deal of time playing with your cockatoo and sharing affections. Keeping a Pair of Cockatoos: Because of their need to socialize, cockatoos are generally best kept in pairs. They also do fine with another bird of similar size for companionship. The main reason for pairing is so that they do not become so dependent on their keeper and their keepers time. Cockatoos and Pets:Cockatoos and other pets, such as dogs and cats, may or may not develop a friendly relationship with each other. This is generally a "wait and see" situation. Other small animals such as rodents and small birds are best kept away from a cockatoo. If they fall prey to the cockatoo's beak, it can be fatal. The cockatoo is highly intelligent but they are not know as great talkers. Their ability to repeat some words or sounds can be accomplished with repeated training, but this is not the cockatoo's strength. Their outstanding ability comes from being great performers! This is demonstrated by such antics as dancing, playing tug-of-war, climbing, and shaking. 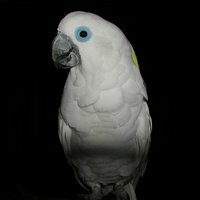 Taming Basics:To be able to handle and train your cockatoo depends first on trust, so go slowly and be consistent. Taming and training is best done in a room with few distractions. A hand fed baby will not need much taming and can often be handled right away, as it is use to human attention. Initial Training: Taming proceeds in steps, start with cage taming where you can approach your cockatoo's cage without it jumping off it's perch and heading to an opposite corner. You overcome this by talking to your pet with soothing words and slow gentle movements until it gets accustomed to you. Advanced Training: Other training, such as tricks and imitating speech will take patience and repeated efforts. Note:Cockatoos that have flight feathers will fly if they out of their cage. If you have a flight aviary, your cockatoo will love to fly between perches widely spaced apart. A cockatoo that is clipped cannot fly so it cannot use a flight aviary. It will take about a year for its feathers to grow back. Bird Food: A Cockatoo diet consisting of a basic large hookbill seed mix with supplements of sprouted seeds and all sorts of fruits and vegetables is generally regarded as suitable. Water: Give you cockatoo fresh drinking water every day. Bird Baths: Most cockatoos really do not need to be washed any more than a cat would. This is because they are extremely clean by nature and preen themselves regularly. They naturally produce a great deal of dust which aids in keeping their wings and skin healthy. However, a cockatoo's personal hygiene may include a weekly shower or bath to get rid of accumulated feather dust. For the bird, bathing is strictly an individual preference, as in the wild some cockatoos will enjoy standing in the rain while others will dive for cover. For a small cockatoo the minimum size of a suitable indoor aviary is about 39" x 39" x 78" (100x100x200 cm), and of course larger for the larger cockatoos. An outdoor or breeding aviary needs to have a protected shelter that can be heated and cooled where necessary and have a sand floor. An attached flight cage should be 78" x 117" x 78" (2x3x2 m) for small cockatoos, and of course bigger for larger cockatoos. One third of the flight cage should be covered. Equip the flight cage with a perch at each end. A climbing branch and a bird bath are nice additions too. Because the cockatoos are threatened with extinction, successful breeding is helping to preserve the species and reduce the number of wild caught birds. There are no breeding regulations in the United States, Canada, or the United Kingdom, though other countries might have restrictions and you should consult with the authorities in your country before undertaking breeding. Pairing Cockatoos:Pet cockatoos have a very difficult time getting used to a mate so are very hard to use for attempts at breeding. Establishing any harmonious cockatoo pair can be difficult. It is best to have several young birds together and let them pair naturally. Sexing Cockatoos:Most cockatoo species are easily sexed. The lesser sulphur-crested, greater sulphur-crested, umbrella, Goffin's, rose-breasted and Philippine cockatoos have a red-brown, brown, or chestnut-brown iris in the female after about two years of age. The Mollucan is basically the same except the female iris is dark brown so it can be difficult to distinguish from the slightly darker iris of the male. Breeding Environment:The best environment for breeding cockatoos is accomplished in an aviary. Place the cockatoo's square nesting box, or a round hollowed out tree trunk of the same approximate size, high in the aviary. On the bottom of the nest box, put a 4" (10 cm) layer of soft bedding such as wood shavings. Egg Laying and Hatchlings:The cockatoo female will lay between 2 to 3 eggs. Brooding, depending on which species, is between 25 to 30 days. The young are naked and blind when hatched and don't open their eyes for several weeks. Hatchlings take between 60 and 100 days to become fully plumed and at that time they will begin to explore outside of the nest. However they will still be dependent for another two to three weeks before ready leave the nest for good. Bare-Eyed Cockatoos are primarily white with touches of salmon-pink on their faces. They have horn colored beaks and bare, gray patches around their eyes. Exercise and play are important bird activities for the physical well being and psychological health of all cockatoos. They are extraordinarily playful. Cockatoos will play all day long with only short breaks for rest.